A Tribal grant project is paving the way to lowering chronic absenteeism for Native American students. An untrained visitor to the Southern Oregon coast would hardly be able to tell where the sleepy towns of Coos Bay begins and little North Bend ends when passing through. This unique split means students migrate between the two towns frequently – perhaps spending half a school year attending one school in Coos Bay and then often moving to a new school in North Bend, or vice versa. The two small towns – considered friendly rivals – share more than an undistinguishable boundary. They’re also the shared home to two Native American tribes – the Confederated Tribe of Coos, Lower Umpqua and Siuslaw, and the Coquille Indian Tribe. The unique boundary arrangement also means rates of absenteeism are higher here, and particularly among Native students. “The kids who have chronic absenteeism also happen to be our most transitional kids, bouncing around. In our area, poverty really has an effect on our families. 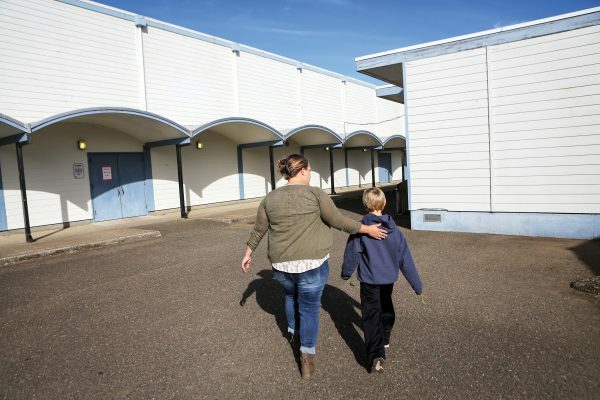 When you are in crisis mode, the last thing you are going to worry about is bringing your child to school when you don’t even know where you’re going to sleep the next night,” says Breana Landrum, a family advocate in the Coos Bay School District. The trends found in Coos Bay mimic rates found across the state when it comes to chronic absenteeism and Native students. It can feel like an invisible crisis – partly because absenteeism is considered chronic when it dips below 92 percent (which averages out to just two missed school days per month), and also because Native students don’t always ‘look’ Native, even though they do carry tribal affiliation. “We have Native students who are blonde haired and blue eyed. You may not even know somebody identifies as Native,” explains Landrum, who knows that experience well; she is a product of Coos Bay public schools and the granddaughter of a former Chief of the Confederated Tribes of Coos, Lower Umpqua and Siuslaw. As a child, she remembers participating in Native summer camps but became less involved as a teenager and adult. After working in Coos Bay schools as an educational assistant for several years, she’s found a perfect fit in her family advocate role – partially because it allows her to tap into a part of her own cultural upbringing, and introduce her own two young children to a piece of their history. Over the course of this past year, Landrum has come to know Coos Bay’s Native students well in her role through the Tribal Attendance Pilot Project (TAPP), a pilot grant project of the Oregon Department of Education (ODE). In 2014, a study conducted by ECONorthwest and the Chalkboard Project titled “Condition of Education for Members of Oregon’s Tribes” revealed that Oregon’s tribe-enrolled students lagged behind their non-Indian peers in reading and math proficiency, and in contrast to all other student groups, tribe-enrolled students reported the highest levels of chronic absenteeism. The study identified that Native American tribe-enrolled students are 14 percentage points more likely to be chronically absent than members of other student groups. The study references absenteeism rates from 2011-201, in which 33 percent of Native American tribe-enrolled students in Oregon were chronically absent, in comparison to 19 percent of ‘other’ students. The project couldn’t be more significantly timed, as chronic absenteeism has now been written into Oregon’s Every Student Succeeds Act (ESSA) state plan as an accountability measure. In Coos Bay alone, attendance rates are climbing upward – average daily attendance among Native students hovered around 90 percent in 2015-16 and climbed to 92 percent the following year. Breana Landrum-Gesberg leads an after school program for Native American students at the Coos Bay Boys and Girls Club. From school to school, the strategies for engaging Native students vary widely, but at its core, the TAPP program is structured by the funding of one Family Advocate position, like Landrum’s, in each of the nine school districts with a federally recognized tribe. The family advocate has deep local connections to create school-wide initiatives to reduce chronic absenteeism. While the intent of TAPP is to improve absenteeism rates among Native students, the school-wide nature of the initiatives has positive impacts on all students attending that school. Landrum’s day begins at the district office, by downloading a report of the day’s absences at both Madison and Blossom Gulch and making phone calls to parents of all absent students, Native and non-Native. The phone calls are often just a check-in to make sure everything is OK – she may offer to bring homework home to students if they need it or arrange phone call meetings with teachers to discuss work done in class that day. After her three hours’ worth of morning calls are done, she’ll jump in her car and head out to the elementary schools, where she usually meets with a wrap-around team of educators and parents to address concerns for students who are facing academic and behavior issues due to high absenteeism. After those afternoon meetings, Landrum is back in her car and off to the local Boys & Girls Club, where she helps facilitate an afterschool program for Native American students – part homework assist, part cultural recognition. For example, this month in honor of Native American History Month, Landrum has brought in members from the local tribes to teach Native drumming to students. One or two evenings a month, she’ll host Native American family nights – and though she doesn’t coordinate the full-school family events, she always attends them so that her name and face becomes recognizable to the parents in that school community. “It’s all about building that relationship,” she says. The structure of her day has evolved in the 18 months she’s held this new position. “This year, I changed course to focus more on that parent education piece – it’s become more about the phone calls,” Landrum says. Last year, she remembers meeting a little girl in Kindergarten whose attendance hovered right around 70 percent – alarmingly low. “Our Indian Education coordinator contacted her family, and they started coming to our family events. She joined our reading groups. I’d make phone calls to her mom, and she’d message me on Facebook. We had such an open line of communication and she ended the school year with 94 percent attendance, meeting the state expectation and our district’s expectation,” Landrum says. Make sure you have a working alarm clock at home. Introduce your child to his or her teachers and classmates before school starts to help them transition. Refrain from letting your child stay home unless s/he is truly sick. Keep in mind complaints of a stomach ache or headache can be a sign of anxiety and not a reason to stay home. If your child seems anxious about going to school, talk to teachers, school counselors, or other parents for advice on how to make your child feel comfortable and excited about learning. Avoid medical appointment and extended trips when school is in session. The successes in Coos Bay, even in a short period of time, have been emerging across the state in every district where a TAPP grant is in place. 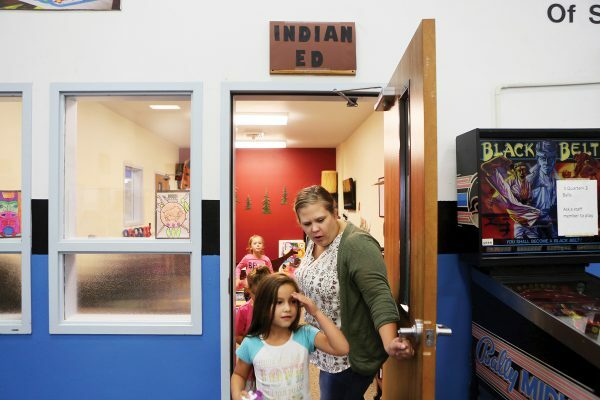 Ramona Halcomb, ODE’s Indian Education Specialist and statewide TAPP coordinator, can rattle off one example after another of successful – and innovative – strategies for reducing absenteeism rates seen across Oregon. In Pendleton, for example, the TAPP project focuses on the importance of language. When you pull into the parking lot of the elementary school, the reader board says “Welcome” in Umatilla (the local tribe). Restrooms are labeled “Boys” or “Girls” in English, and in Umatilla. “For people who understand our boarding school era history, in which speaking our Native language was not allowed, for this district to do a full-180 and bring language back into the schools has been so powerful,” says Halcomb, who herself is an enrolled member of the Confederated Tribes of the Umatilla Indian Reservation. In Klamath County, the TAPP grant has focused on professional development with a special emphasis on mindfulness. The training was delivered to all employees – teachers, administrators, custodians, food service staff, and more – all learning how to de-escalate situations with students. In Lincoln County, the TAPP family advocate noticed a mom needed some extra support in parenting at home. The advocate designed a simple chore chart for the parent and child, and provided the stickers for completed tasks. At the end of the week, the TAPP project provided a small prize to that child for a completed chart. This year, Halcomb hopes that family advocates across the state will be able to weave together stronger connections with the Tribes and tap into the tribal programs already underway. “Building those stronger connections with our tribal partners is what’s going to make TAPP sustainable, so we don’t get so grant-dependent,” Halcomb says. Each site is granted $150,000 per biennium to put their plans in place and fund the family advocate position. This year, the Legislature increased the project to $155,000 per site for the 2017-19 period. In three of the nine districts where TAPP is in place, school superintendents have committed to finding ways to continue funding the efforts once the grant period ends. Halcomb hopes to see that number grow this year. 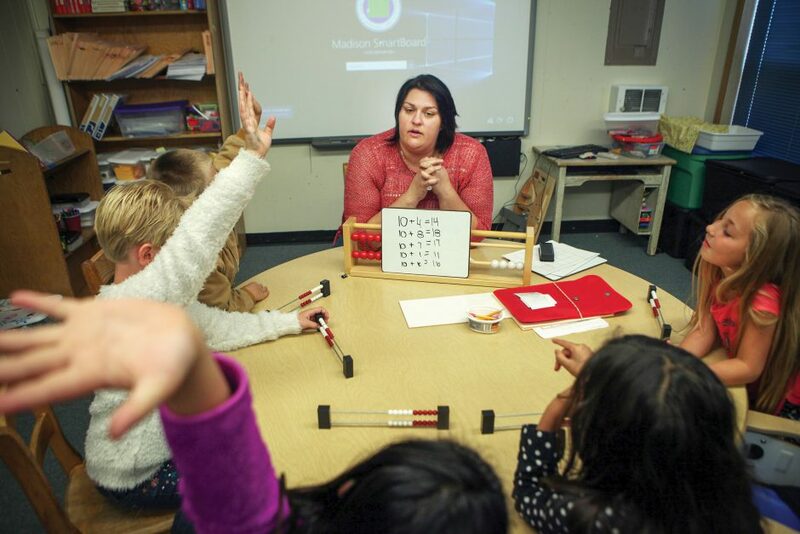 Michelle Boice teaches a special education class at Madison Elementary School. To Halcomb, TAPP helps underscore that fundamental core value of education – that one caring adult can make all the difference in a child’s life. The program moves the conversation toward a more holistic view of each student; instead of “What’s wrong with this student?” we look at “What’s happened to this child?” For Native students, any combination of factors – historic trauma, higher than average referral into special education programs, rural locations and barriers to accessing social services and healthcare, higher rates of suspension, and poverty all play a role. “You’re walking on a lake that hasn’t fully frozen, and at some point, there’s going to be a crack. Some kids are going to fall through it,” Halcomb says. According to ODE literature on Trauma-Informed Practices in Schools, “Adverse childhood experiences (ACES) have a huge impact on the learning and lives of individuals. Addressing trauma early in life through trauma informed practices can improve outcomes for individuals. The work around trauma-informed care as a method for reducing absenteeism kicked into high gear during the 2016 legislative session, when a landmark bill to address “chronic absences of students” (HB 4002) passed the Oregon legislature, requiring two state education agencies to develop a statewide plan to address the problem and provide $500,000 in funding for trauma-informed approaches in schools. While vastly more funding will be needed to fully realize this approach across the state, it provides a start at leveraging funds, including those available through ESSA. Landrum and Boice work closely on ensuring that PBIS best-practices are part of the TAPP efforts; over time, this has resulted in some switching of gears when efforts weren’t lining up. For example, Landrum decided not to offer incentive prizes to students for individual attendance efforts at Madison, because it doesn’t align with the community-minded PBIS model at the school. Instead, she’s invested grant dollars in books for each classroom that teach empathy and flexibility. 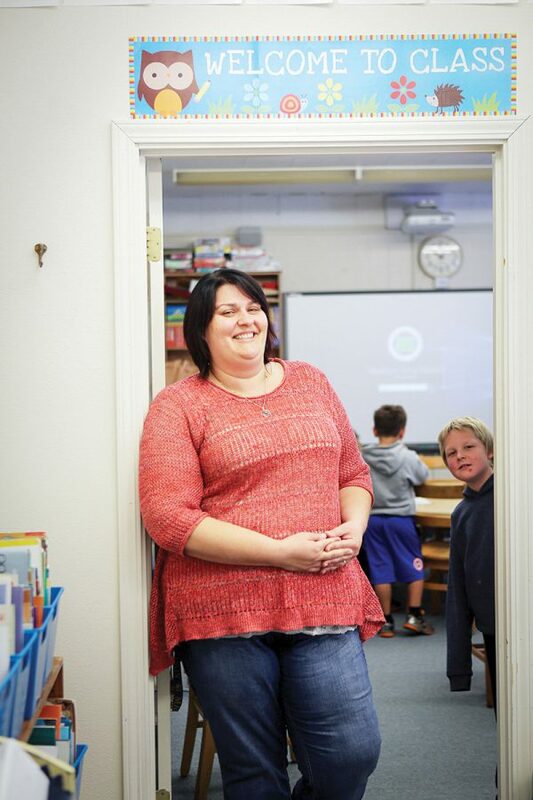 “The first thing you can do is make your [classroom] a space that children want to come to. It provides that wraparound model of care.” She’s also used some funds to provide books to every Kindergartener coming in to the district, and produced magnets with all of the no-school days, which she hands out to parents. Educators involved in the TAPP effort sees huge promise moving forward, especially with the passage of Senate Bill 13 during the 2017 Legislative Session. This new bill will require the teaching of American Indian/Alaska Native History and Sovereignty, written from Native perspectives, in K-12 public schools across Oregon. It was signed into law on Aug. 2. The Western States Center, which convened the coalition to pass SB 13, believes that over the long term, all Oregon students will benefit from a better K-12 curriculum regarding Indian History and Sovereignty, and Indian students will have better educational attainment and retention because they will see themselves reflected in curriculum.